Street parking is available and plenty of Downtown Parking Garages nearby. We are located in the center of Downtown Salt Lake City, within walking distance of many hotels and entertainment venue. Theres also a Trax station just a couple blocks away on main street. Our banquet room is perfect for your private dining need. Seats up to 50 guests. We have an A/V setup with projector available for presentations. Perfect atmosphere for any type of occasion; anything from business presentations to wedding rehearsal dinners. Please contact someone from our management team to inquire about availability. 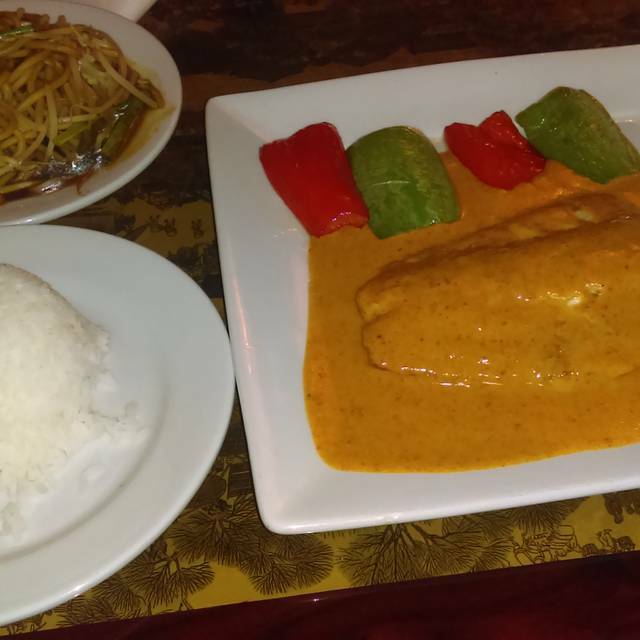 J. Wong's Thai & Chinese Bistro is located on South Salt Lake City, Utah and specializes in serving Thai and Chinese style cuisine. The restaurant offers online ordering and takeout services, which includes delivery service to a limited area. J. Wong's Thai & Chinese Bistro is available to book for events and private parties, as well as catering services. The menu features starters, soups, sides, small plates, Chinese and Thai entrées. A full service bar and drink menu is available. Some of the featured entrées at J. Wong's Thai & Chinese Bistro include filet mignon stir fry, general tao chicken and black bean red snapper. All entrées are served with choice of brown rice, white rice or see yao wong lo mein. Deep fried cream cheese wrapped in wonton skins. Puff pastries filled with chicken, onion, potato and savory curry seasoning; served with a cucumber relish. Carrots, cucumber, lettuce & rice noodles wrapped in fresh rice paper. Served with peanut sauce. Chicken wings glazed in our famous General Tao sauce. Black pepper, sesame oil, shrimp and bacon wrapped in spring roll skin and fried crispy. Served with peking sauce. Charcoal-grilled chicken tenders marinated in a blend of Thai herbs. Served with peanut sauce, cucumber relish and a crostini. Battered calamari or fish tossed with bell peppers, onions, jalapenos, fried garlic & baked salt. Crispy fried tofu served with sweet Thai chili peanut dipping sauce. Steamed egg noodles in savory red curry coconut broth, topped with Char broiled pork, red onions, scallions and crispy noodles. Fresh rice noodles sautéed with chicken, egg, scallions, bean sprouts, and ground peanuts. Flat rice noodle, chicken, baby corn, celery, bell peppers, onions, garlic, Thai basil, and Thai chili stir-fried in soy and oyster sauce reduction. Five Spice braised beef, egg noodles, and bok choy in savory broth. Shrimp Wontons, chicken, char-sil pork, bok choy, snow peas, and egg noodles in savory broth. Seasonal vegetables, fried tofu, and rice noodles in savory vegetable broth. Thinly sliced charcoal-grilled New York Steak, red onions, scallions, cherry tomatoes, fresh mint, roasted Thai chilies, and cucumbers tossed in lime vinaigrette. Pan seared tofu topped with red onions, young celery, carrots, cherry tomatoes, and chili lime garlic vinaigrette. Charcoal-grilled eggplant topped with red onions, young celery, carrots, cherry tomatoes, and chili lime garlic vinaigrette. Lightly battered baby back ribs glazed in our famous peking sauce. and spring onions wok-seared in spicy soy reduction. peanuts, bell peppers, yellow onions, and Tianjin chilis stir-fried in spicy soy reduction. pineapples, bell peppers, yellow onions, and carrots wok-tossed in our famous sweet and sour sauce. wok-tossed with our famous General Tao sauce. Sliced flank steak and broccoli florets in soy reduction. Lightly breaded shrimp in rich creamy sauce topped with honey-glazed walnuts. Sliced chicken breast, potatoes, carrots, and onions simmered with coconut milk in tumeric, cumin, lemongrass curry paste. Sliced chicken breast, bamboo, bell peppers, and basil simmered with coconut milk in dried red chili, lemongrass, galangal root curry paste. Lightly battered sliced chicken breast wok-tossed in tangy orange sauce. Lightly battered sliced chicken breast, green onions, and tangerine peel wok-tossed in tangerine sauce on a bed of crispy wonton chips. Lightly battered sliced chicken breast wok-tossed with tangy sesame sauce on a bed of crispy rice noodles. ginger, mushrooms, baby corn, and yellow onions stir fried in Thai ginger sauce. 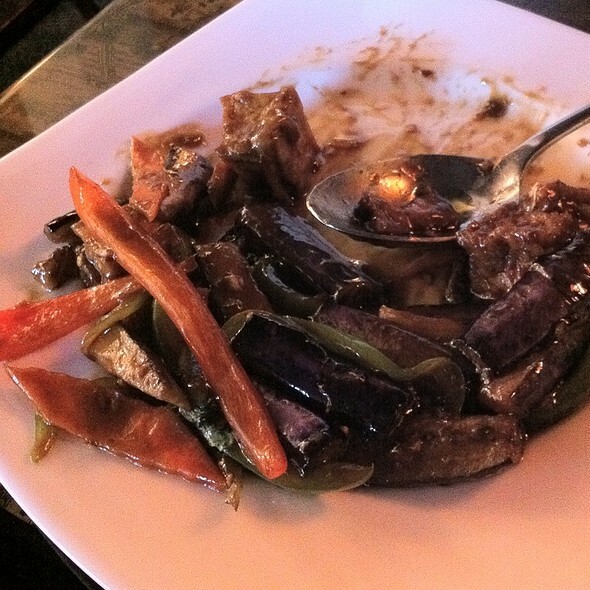 Sautéed eggplant with bell peppers and onions in Thai chili basil sauce topped with fried basil. and string beans stir fried in a sweet red curry paste with kaffir lime leaf. Minced chicken breast stir fried in Thai chili basil sauce topped with fried basil. Sliced chicken breast and string beans wok-tossed in savory black bean sauce. Charcoal-grilled chicken quarter marinated with lemongrass, garlic and soy sauce. Served with spicy tamarind dipping sauce and fresh green papaya salad. Stir-fried cabbage, carrot, celery and bean thread noodles wrapped in spring roll skin and fried crispy. Served with plum sauce. Stir-fried cabbage, carrot, celery and chicken wrapped in wonton skin; battered and deep fried. Served with plum sauce. Minced pork sirloin, red onions, scallions, cilantro, roasted rice seasoning and fresh mint in a roasted chili lime vinaigrette. Chicken, egg, bamboo, black mushrooms and tofu in a savory, tangy broth. Shrimp wontons, pork, shrimp, chicken, snow peas, bok choy and napa cabbage in a sesame soy broth. Enoki, button, and oyster mushrooms in spicy Thai lemongrass herb broth. Sliced chicken breast, spicy Thai herbs, and mushrooms in savory coconut broth. Lightly battered tofu and bell peppers wok-tossed with our famous General Tao sauce. Fried tofu, carrots, shitake mushrooms, and snow peas stir-fried in ginger soy reduction. Lightly battered sliced chicken breast wok-tossed with our famous General Tao sauce. Sliced chicken breast, cashews, carrots, and celery stir-fried in soy reduction. Sliced chicken breast, peanuts, bell peppers and yellow onions, stir-fried in spicy soy reduction. Sliced chicken breast and broccoli in soy reduction. Sliced tender flank steak, bell pepper, yellow onions and black pepper wok-seared in black pepper soy reduction. Sliced flank steak, bamboo, black mushrooms, bell peppers and scallions in tangy, spicy soy reduction. Sliced flank steak and broccoli in soy reduction. Sliced flank steak and spring onions wok-seared in spicy soy reduction. Sliced flank steak and string beans wok-tossed in savory black bean sauce. Shrimp, peanuts, bell peppers, and yellow onions stir-fried in spicy soy reduction. Shrimp, cashews, carrots, and celery stir-fried in soy reduction. Potatoes, carrots, and onions simmered with coconut milk in tumeric, cumin, lemongrass curry paste. Bamboo, bell peppers, and basil simmered with coconut milk in dried red chili, lemongrass, galangal root curry paste. Snow peas, bamboo, bell peppers, and basil simmered with coconut milk in fresh green chili, wild ginger, lemongrass, kaffir lime leaf curry paste. Potatoes, carrots, onions and peanuts simmered with coconut milk in dried red chili, tamarind juice, lemongrass, galangal root curry paste. Bell peppers and kaffir lime leaves simmered with coconut milk, dried red chili, lemongrass, galangal root curry paste. Stir-fried sliced chicken breast, carrots, yellow onion, scallions, bell peppers, and bean sprouts in ginger soy sauce. Stir-fried seasonal vegetables in ginger soy sauce. Five Spice braised duck, egg noodles, bok choy, and shitake mushrooms in savory broth. Shrimp, char sil pork, ham and egg. Seasonal vegetables, fried tofu, and egg. Steamed Chinese broccoli topped with oyster sauce and sesame oil. Green beans wok-seared in black bean sauce. Bailing mushroom & bok choy stir-fried in garlic soy sauce. Fresh egg noodles, spring onions, and bean sprouts stir fried in soy sauce. This is a great "go to" restaurant, especially with out of town guest, we never leave disappointed. The food was great, service excellent and good value. My friends were extremely pleased with my choice of a place to eat. Delicious. Seriously delicious. I would eat there weekly. The ambiance is calm and the service is great. This was my second trip to SLC and my second time at J. Wong’s. I have never forgotten the amazing honey walnut shrimp I had there and was determined to go back just for it. It did not disappoint! Delicious!! The food is absolutely delicious. The restaurant has a nice atmosphere and great location. My daughter and husband can’t wait to go back! This is a great place to meet with friends. Its quiet. The food is always wonderful! The service is friendly and efficient. Excellent dinner with a friend. We shared chicken basil pad Thai, green beens, and sauteed garlic spinach with a glass of wine each. It was quiet and we had a private booth so that we could have a nice conversation. great place to eat Asian food in Salt Lake City, they were fast to sit us, wait time was less than a minute, service was good and my guest liked their meal. I would highly recommend this place for a quick median priced evening out. This was our first time eating at J Wong's. The food was delish, the service was spectacular, and the ambience was lovely. I hope to return very soon! Great experience for Chinese New Year. Lion Dance lasted 20 min; restaurant texted to make sure we knew it was happening. Peking duck very crisp and flavorful (takes about 20 min, which they told us). Service attentive without being obtrusive. Mango sticky rice desert tasty (rice is warm with lots of coconut). Great selection of both thai and Chinese cuisine. Nice ambiance and convenient location. Very good service. This is our favorite place to eat in slc. The food is consistently great. The service is always the best. We ordered appetizers and asked for them to come first. All food came at once and some cold. Shrimp and scallops were breaded, not expected or described on menu. It was ok, nothing more. I had a curry dish that lacked much curry flavor. 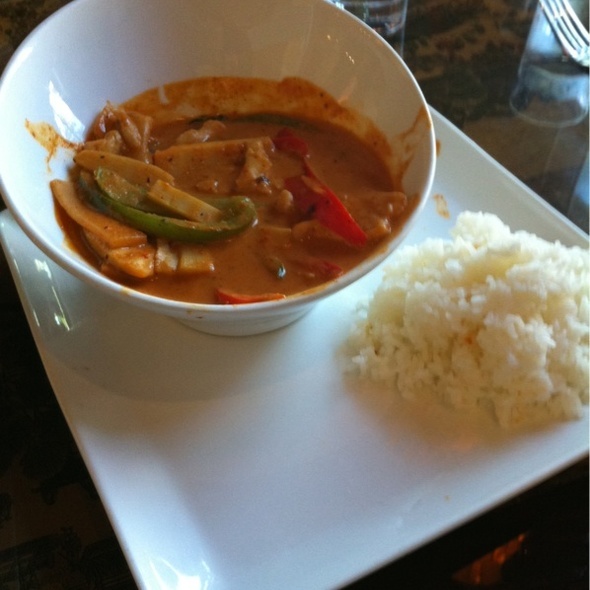 The dishes were quite bland and lacked the seasoning I expected for Thai. The curry appetizer was very good though. Excellent spot we go to every time we are in Salt Lake City. Great food at a great price. The service is very good and helpful. Excellent place, great food, good service. Worked out well for a last minute, “Night Out on the Town” situation. Would definitely recommend to friends! Food was ok, but ridiculously small portions for the price. Not worth a return trip. Loved that we could sit and visit with friends in a no-rush atmosphere. Food was great. Good sized portions for sharing. Good options. The worst thing is that it’s right next to a bar so the cigarette smoke would drift in when the door opened. The service was terrible. Waited ten minutes to be told that they couldn’t actually make the drink we ordered. The dining room had no servers on several occasions. Waited again for our bill. Food was average...salmon of grocery store quality and bland panang. So disappointing. I used to love this place. Tried J Wongs for the first time. We were all impressed that this was not the "usual" Chinese Sysco fare. The flavors of the various dishes were excellent. The prices were moderate, about $13-$18, but some dishes were $20-$30. Recommend the lettuce wraps, wonton soup, and walnut shrimp. My son had the Mossaman curry lamb and loved it. Lo Mein needed salt, we all agreed, but, generally, we all voted to go back to J Wongs again. Went here for my 10 year old sons birthday dinner with our family. The kids loved the food. Price was good. Overall a very positive experience. The waitress even brought out cake (no charge) without being asked. Trying to eat before attending Eccles theater on Sunday evening can be a challenge. We were grateful that J. Wong's was available and had easy street parking available. Walking a couple of blocks to the theater afterward is very easy. Dinner was delicious. 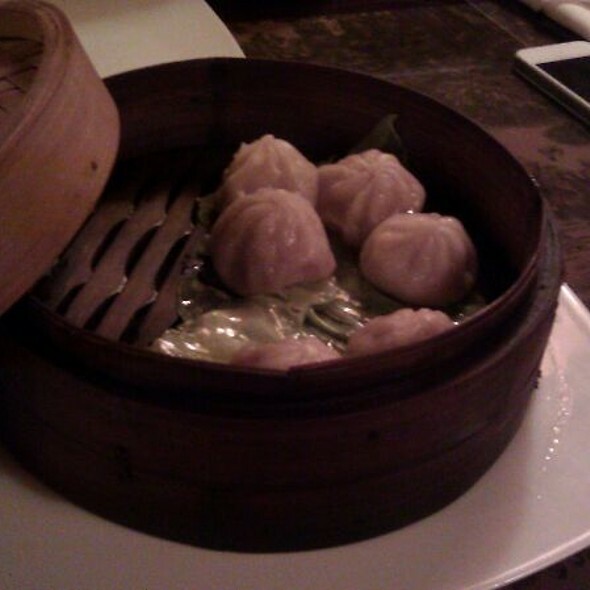 We enjoyed soup, potstickers and shared two entrees among four of us. 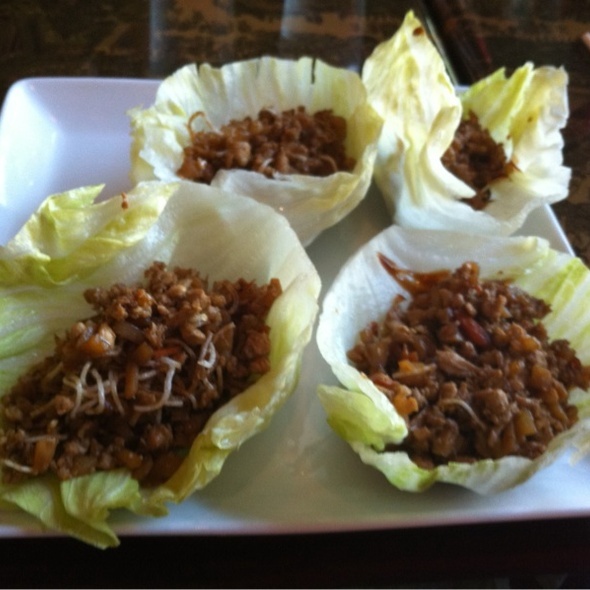 We added the baby bok choy side and found it very good. We requested the Tangerine Chicken be prepared with chicken that was unbreaded, stir frying rather than deep frying. Perfect choice for our group. Our server was very accommodating. Worst Pad Thai ever. Noodles were mushy and cold, without peanuts or lime. Husband’s dish was cashew chicken and was inedible: rubbery chicken and no sauce. Could not get server’s attention. Can’t believe someone let our meals leave the kitchen as-is. Obviously, no pride in what they serve their customers. Sorry, but one of the worst meals ever. The service was slow considering there was no one in the place. When the appetizer and soup arrived it was cold. Again the waiter was nowhere to be found, no chance I would ever stop into this establishment again. We went here twice during a convention. It’s very convenient to the convention center. The service is slow. They don’t seem to have enough servers. Refills of water was non existent. The food is way above average. The prices are reasonable. The staff is somewhat bewildered but pleasant. As long as you have time, it’s great. PERFECT for lunch while you're at a convention - directly across the street from the Salt Palace Convention Center. My team and I eat here for lunch every time we have a conference. Varied menu, relatively inexpensive, and able to seat a large group. I enjoyed J Wong's, the food was very good and the atmosphere as well. Service was good also, I will be heading back to J. Wong's. An impromptu date night with my lovely wife to celebrate a good week, and as it was still fairly early on a Friday evening, J Wong had space available and we walked right in. We settled in with a glass of wine and the food was ready so quickly we were both kind of surprised. 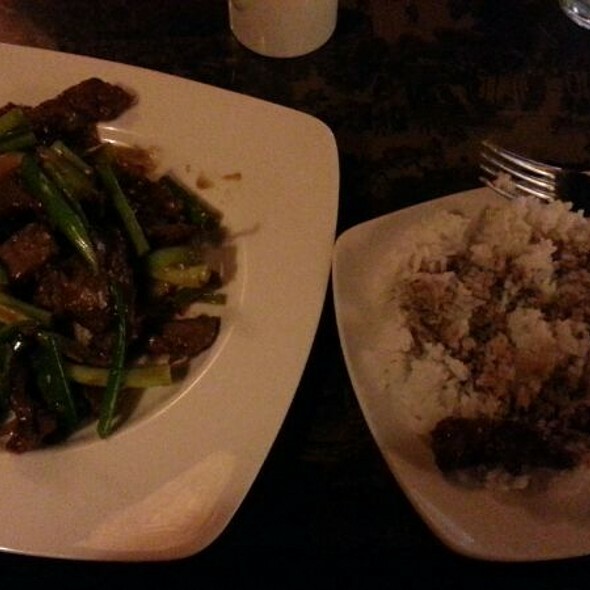 I ordered Thai, my wife Chinese, and both of us were very happy with the quality, quantity and taste of our meal. The ambiance was nice, a nearby group sang happy birthday, but it didn't really bother anyone, I can't hold that singing against the restaurant. Our waitress was very nice and accommodating, but as the restaurant filled up the staff had more to handle and we waited for a while to get our check then have it picked up. Still, that was pretty minor. My only other recommendation to the restaurant would be to implement some kind of 'heat scale' for the Thai curries, as what one person considers 'medium' another may find quite spicy. I like spicy food and requested a hot curry, but would like to have had a better sense of just how hot they consider hot. This is not a problem unique to this restaurant, but some others have found a way to try to meet/manage customers' expectations. Over all we had a lovely downtown date night meal and wouldn't hesitate to go there again or recommend to others. Awesome restaurant with excellent food and service. While I was in town, I took my staff out for lunch as it is one of their favorite lunch sites. Everything was as delicious as they said. This is a definite place to return for either a quick lunch and I will be anxious to return for dinner. Thank you! Very accommodating for large parties. Food was very good! We enjoyed our time there! visiting family in SLC looking for other than fast food or Mexican, found listing on Open Table and almost walked out on arrival because the large restaurant was completely EMPTY (not a good sign) but bc of time and large group of us, decided to try it. Very happily surprised! food was delicious. Business meeting. Felt a little rushed due to high volume traffic/walk ins- convention conference near by all on a break for dinner without reservations. But over all very good. Found this place a year ago while at a convention, service was great food was delicious. Went back this year and was not disappointed, it will be an annual destination! Restroom was flooded and disgusting. Food was okay. Server was nice. We went for dinner, maybe it is more of a lunch place. Service was very quick. Appetiser was ready even before we could choose the main dish. overall: good restaurant. I would return. The waitress was friendly and accommodating. The food was GREAT. I ordered several plates and shared it family style.